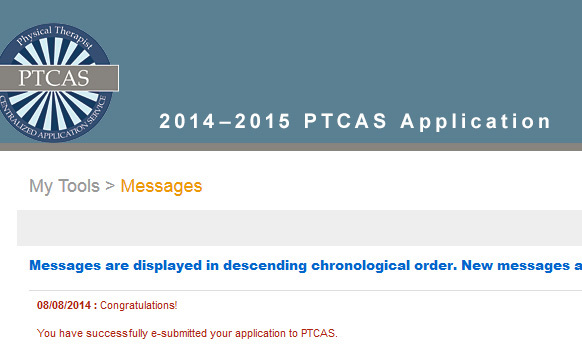 I submitted my PTCAS application! I applied to 9 programs through PTCAS. One requires a supplemental application that I can finish now. I have two definite supplemental applications to complete after October 1st, and 2 potential supplemental applications if I am accepted. I have one more school to apply to that has an October 1st deadline, and they don’t use the PTCAS application. I thought I’d feel more relieved after I submitted most of my work, but I don’t. I’m still waiting on my professor to write his letter, and I’m nervous about the GPA calculations because PTCAS averages the classes that you repeated. I also have a personal statement to finish for the last school, which is the only reason I haven’t applied to that school yet. Did you celebrate after you submitted your application? Comment below with your story! Next Next post: First Interview Invite! Hey, i have been reading your blogs and they are really intresting, because of the amount of insight you give on pt school,i just want to know how much did you pay roughly when you were applying through the ptcas application for the schools and other expenses like traveling and such. I hope you did great this semester and that you do great in the future semesters. Thank you for your diligence with the blog! Thanks so much for the sweet comments. 🙂 I just wrote a blog post here, so hopefully that answers your question! Just read the blog and it helped alot. Thank you, really appriciate it!